I’ve always been a casual fan of director Tobe Hooper’s notorious 1974 vision of terror… it’s a very raw and unrelenting experience that certainly leaves a mark. This 1986 follow up, further more unavailable for years in the UK reunites us with the cannibalistic Sawyer family as a Texas Marshall (Dennis Hopper) tries to track them down, thirsty it seems for revenge. Meanwhile a plucky radio DJ becomes embroiled in the hunt. There’s certainly a more tongue-in-cheek tone to this and it only marginally works. It gives an already crazy concept an even nuttier vibe which came off for me more annoying than scary or disturbing. The Sawyer family this time around are given a little more character, thanks mostly to Bill Moseley’s deranged ‘chop-top’ and we also see a side to Leatherface I wasn’t expecting. Add to this a volatile, unhinged turn from Hopper who’s character is rather cartoonish but still entertaining. 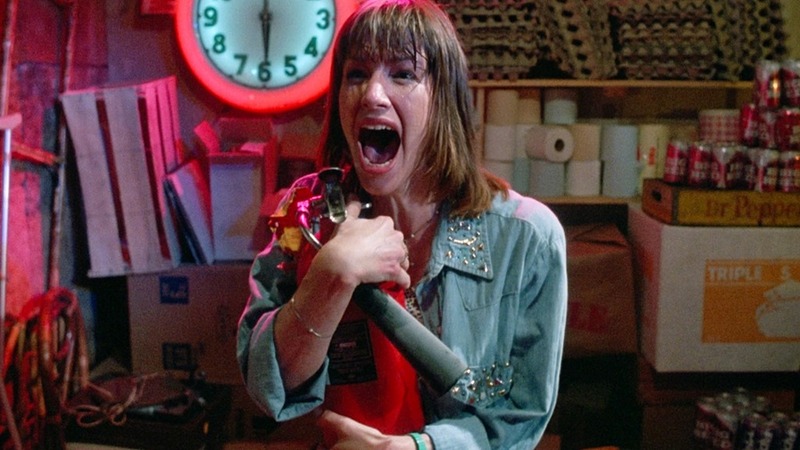 The big let down acting wise is Caroline Williams as radio DJ ‘Stretch’ Initially she seems interesting, spunky and a good heroine … but then becomes scream-queen and oh boy, was she annoying! I’ve watched my fair share of scream queens and this one, was so over the top I was quickly hoping the Sawyer family would just end her. Gore hounds are only slightly catered for, despite the presence of effects artist Tom Savini… so we get a skinned face and some chainsaw meets guts stuff, but not much else. Overall the movie isn’t as visceral or effectively disturbing as either the original or the remake … but as a frantic, crazy ride this still entertained. Considering this sequel’s reputation though, I was expecting … more. The Blu-ray from Arrow Video boasts a detailed, clean and vibrant picture and even though the soundtrack is only the original 2.0 stereo it’s sharp and very effective. The disk itself is packed with extras, with ‘It Runs At Night’ a six part documentary, and we also get several interviews with cast, crew and horror critics. Add to this two commentaries (one with director Tobe Hooper and another with Caroline Williams, Bill Moseley and Tom Savini) making this deluxe treatment for what is otherwise a fun if forgettable entry in the franchise. This entry was posted in Blu-Ray, Horror Reviews, Movies, Reviews and tagged Bill Moseley, Caroline Williams, Dennis Hopper, The Texas Chainsaw Massacre, Tobe Hooper, Tom Savini by Craig M. Bookmark the permalink.